I suddenly miss my husband. Not because it's rainy outside and the weather's perfect to snuggle, cuddle and more, I just miss him. I wanna see him tonight, stare at his face until he sleeps on me. Yes, even without making love; but if he's up for it, why not. Haha! Seriously, after we talked on the phone tonight, I realized how much time we've lost because of the distance. When we were still living with MIL, she always used to insinuate why I'm always on my phone. She's a military wife, too but no cellphones yet during her time so I guess it's useless to explain. I know my fellow modern military wives will understand how we always expect for a text message or when we're lucky, a call from our solja boys. In reality, if we will count the days we are physically together as a couple, more or less, it's two years. Sigh. Sorry for this senti vibes I'm sending you, guys ha. I can't help it eh. I remember that exchange of comments I saw on FB years back. Some "civilians" were dissing those in service. The bastards said the salary of those in uniform are from the taxes the Filipino people are paying daw; that it's just a must to give their heart and soul in doing their jobs. LET ME MAKE TARAY HERE. Excuse me kuya, yang kakarampot mong tax, ito ang kapalit no - itong nararamdaman ko ngayon at pangungulila ng bagets! Jusmiyo. And fyi, according to my husband's payslip, he pays the taxes, too. So tumigil-tigil ka, ikaw palalakarin ko sa bundok para ayusin ang 'Pinas eh. 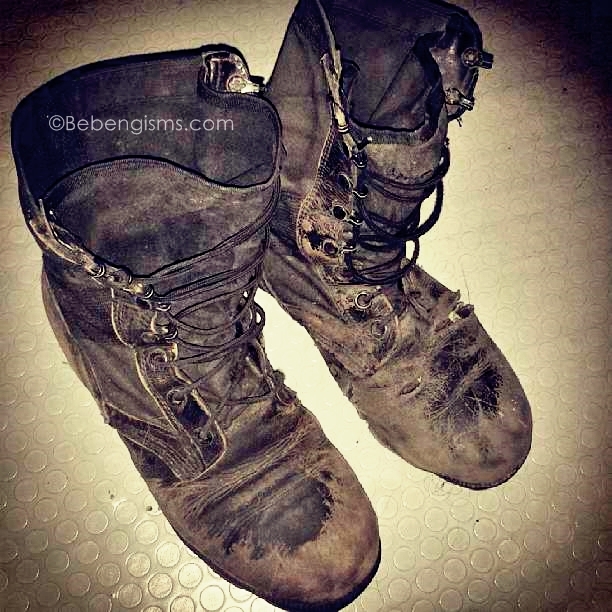 Try to be in these combat boots, ewan ko lang kung kayanin mo (especially ang amoy hehe). OK, that issue is debatable, I won't go further. You see, I may have my little punk here with me but I feel alone tonight. I want to be by his side even if he's just snoring. I wanna smell his manly scent, hug his ever-growing carbs-filled belly and wake up tomorrow seeing him downstairs (yup, R's an early-riser).